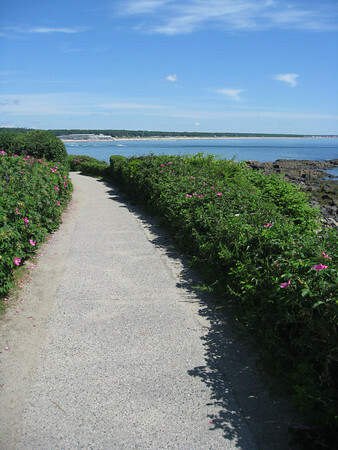 Yes, Ogunquit, Maine's Marginal Way has spectacular views of the ocean along the full 1.25-mile walking path, and that's certainly a key reason why so many people use it. Not every community is so fortunate to have such breathtaking scenery for a trail. However, there are many other towns with beautiful coastlines, but without the popularity of Ogunquit's. (One might argue at the height of summer that perhaps it's too popular, but that's a discussion for another time.) It's not only the views that make the Marginal Way such an appealing walking environment. * Appealing destinations at both ends. When you walk the Marginal Way, you're not only enjoying the views; you also end up someplace, well, worth ending up: walkable Ogunquit town center on one end; walkable Perkins Cove at the other. (And those who don't want to make a roundtrip can hop a trolley bus at either end.) Something to think about when designing railtrails. * Easy entrance/exit at several points along the trail, not just each end. There are clear, well-marked and attractive ways to join the trail at several points besides the start and finish. So you know you're not trapped (or force to cut through places you're not necessarily meant to be) when you start out. * Not cut off from town. When you think nature trail, you might think of paths that go through woods or other nature areas, far removed from the sights and sounds of a city. However, the Marginal Way works so well for pedestrians of all types and not simply nature hikers, precisely because it's not cut off from the community. While nature is on one side, the town is very much on the other. And the homes and yards looking out at the trail help give it a feeling of safety. It's the same reason why having windows of homes or businesses close to a sidewalk in a city center makes for a much more appealing walking environment than a garage door or blank wall. * Benches along the way. Those benches allow people who may not want to walk the full length at once not to be intimidated by the trail; and having a lot of people relaxing along the way also makes for a nicer environment for those out for a stroll. * Great upkeep. Trash is picked up, plants are well trimmed, weeds are kept at bay. A well maintained trail also feels safer and more appealing than one with litter and out-of-control plants invading the walking area. Great post Sharon. I know the Marginal Way very well and you hit the nail on the head. And if you look at the people on the trail, many of them I bet are the type who rarely would go on a walking trail, but the points you made, particularly about the view and destinations, really draw people in. There's a similar trail in Bar Harbor, Maine, not anywhere as famous as the Marginal Way, but it gets a lot of traffic, because at least at one end is downtown. People often stroll it at night as well for the beautiful ocean views and breeze! Dogs not welcome and my dog loves perkins cove. Then again, there is a nice dog park in kennebunk and there will be one soon in OGT.